Every year that passes brings more growth, lessons learned, new adventures, and much more. This past year was a busy one for GreenRope. From our CEO’s launch of CRM for Dummies and his speaking tour around the world to new features and upgrades to the GreenRope platform, each year we learn something new and look forward to becoming even stronger in the year to come. To finish off the year right, we wanted to take a moment to look back at some of our biggest accomplishments this past year and give you a peek into what you can expect in 2018. Every year, we make it our priority to improve the platform, your customer experience, and of course, your business life. Giving you the right tools to help you streamline, automate, and deliver is our number one goal. 2017 was no different. This past year, we were able to make significant upgrades to the system, making GreenRope one of the only complete business managements platforms out there. Along with some new features and system-boosting upgrades, our CEO, Lars Helgeson published CRM for Dummies and made a trip around the world speaking at CRM, strategy, and marketing focused conferences and events. GreenRope E-Signatures: GreenRope announced the launch of its E-signature module which allows users to create, send, and track documents, proposals, and contracts electronically. You can easily customize your documents, send them from within the platform and track document activity. Signatures and approvals can be sent, received, and reviewed within minutes. Each document is automatically stored with the contact it was created for, making the entire document signing process seamless from start to finish. Integrated Project Management: GreenRope expands project management capabilities and makes managing, tracking, and billing projects quick, easy, and efficient. Whether you are tracking team projects, tasks, and progress or billing clients for work completed, GreenRope’s new project manager is intuitive and includes all the tools you need to increase productivity, accountability, and transparency throughout your team. Our favorite feature? The new Kanban Board provides a visual summary of all of your projects and tasks, allowing you to easily move each task throughout their appropriate stage. 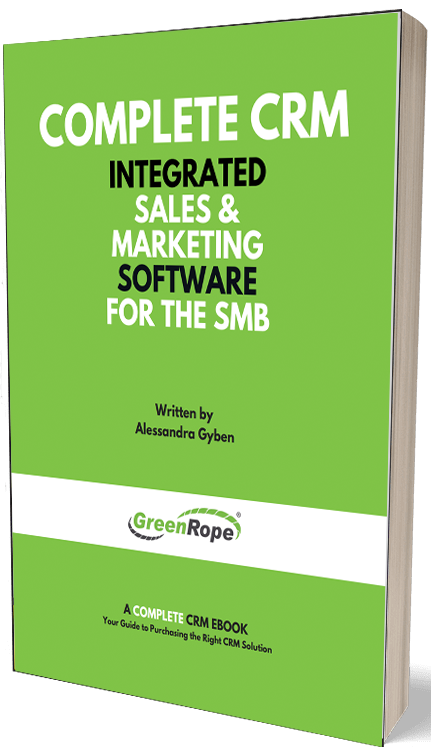 CRM for Dummies: Lars Helgeson, CEO of GreenRope writes and publishes a book on CRM strategy and implementation for the internationally recognized ‘For Dummies’ series. Lars’ book covers every aspect of CRM and is a great read for both new and seasoned CRM users. CRM for Dummies covers important strategic initiatives, but also gives you a step-by-step on how to make CRM work for your organization. The book comes with a ton of helpful tips, resources, and more. CEO Speaking Tour: As GreenRope grows, so does our influence. This year, Lars Helgeson was selected to speak at a number of business conferences and events to help educate and connect with business leaders around the world. Users Love GreenRope: As we continue to grow with your support, GreenRope is becoming a crowd favorite amongst a number of review sites including G2Crowd, Capterra, and GetApp. Besides receiving accolades for our extensive feature offering, GreenRope ranked high in user satisfaction, customer support, and system functionality. Here at GreenRope, we couldn’t be more excited for 2018. We’ve got some big plans in the works including new features and upgrades to help you maximize your sales, marketing, and customer support next year. Custom Objects: GreenRope adds increased flexibility and customization to your GreenRope account. Custom objects allow you to store unique information specific to your business in your CRM. This addition means that your GreenRope account can be completely tailored to meet the data needs of your business. Continued Client Support: In 2018, our focus continues to be on you, our customers. We maintain our commitment to providing our users with world-class, 24/7 real person customer service. Why? Because your success is our success. To service you even better, we plan on hosting a number of new strategy webinars, learning sessions, and panels to help you develop and implement new strategies for your business. We will also be releasing a ton of new articles, how-to’s, and tutorials to help you get the most out of the GreenRope platform. Every year I like to think about what I’ve learned from my team, our clients, and of course our business. No matter what, as a leader, you should always be exploring and trying (and sometimes failing) new strategies and approaches to sales, marketing, and operations. Here are a few of the most important lessons I learned this past year. Be diligent with pay-per-click. Google has changed a lot about how they post ads and if you aren’t careful, they will go over your max per-click cost and will put your ads against unrelated search terms. Stay in the know and on top of Google’s changes as they can significantly affect your results. PPC is not a set it and forget it effort. Determine a strategy and manage it daily. Fine tune your messaging. This year, it was reinforced to me how important it is to explain to our customers how to calculate the total cost of design and implementing CRM. Most importantly, including the cost of integration because often it’s a hidden, unexpected cost that hits long after the decision to pick a CRM is made. This is the key to our value proposition, among the many benefits to using GreenRope. Applying this to your business, the lesson is to make sure that when you are going up against competitors, you accurately educate and inform on the true value you bring to the client. Update your content to reflect each value proposition in a simple, easy-to-understand message. Along those lines, we need to have more conversations about Total Cost of Ownership (TCO). In our industry, many traditional CRM platforms are more expensive than they let on because they try to avoid talking about TCO. After researching our competition and interviewing people who have left “old school” CRMs to work with us, we find we are able to save them close to 95% total cost of ownership. We have found that many software vendors in CRM and marketing will underestimate the cost and schedule impact of software that doesn’t combine sales, marketing, customer service, and operations together into one platform out of the box. By forcing companies to figure out the integration problem, it puts the burden back on the company to become an expert in CRM technology, which is a distraction from their ultimate goal of growing their businesses. Applying this to your business should be a similar approach to looking at all of the costs associated with the problem you are solving. When your market understands the whole picture, you should be able to communicate how you address both direct and indirect, sometimes hidden costs. Everyone should be concerned about the new General Data Protection Regulation (GDPR) regulation being formulated in the EU. The fines are steep, and it would appear to affect every single business in the world. This means enforcement may focus on only large businesses, but it’s hard to say how this will be actually rolled out. We will pay close attention to this in the coming months and will keep you informed. A new lesson is learned everyday and as business professionals, it is our job to remain on top of our game. Our team focuses on helping you stay educated and informed on strategies, technology, and trends that affect the way you run your business. As a software company, we want to offer the best in CRM, marketing automation and business operating technology, but as an organization, we want to help you succeed through hands-on support, education and interaction. We look forward to a profitable 2018!